Monitor the temperature of your Intel Mac. Is there a better alternative to CoreDuoTemp? Is CoreDuoTemp really the best app in System category? Will CoreDuoTemp work good on macOS 10.13.4? 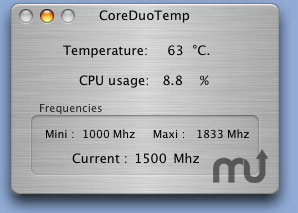 CoreDuoTemp monitors the temperature of your Intel Mac. Required configuration: iMac 2006, MacMini 2006, MacBook Pro, MacBook.